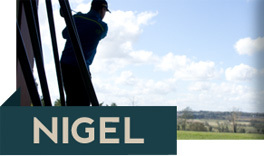 If you’ve ever wanted to see a before and after story of how playing with ForeGolf custom built clubs can make an improvement over standard clubs, I’d like to share Nigel Doherty’s story. Good balance , and a decent ability to make a solid turn. Lacking in power, hence the club needs to aid in producing it, with also aiding with consistency and control. TaylorMade Burner 2.0 65g Regular Flex Graphite. The shafts were too short in length creating a poor posture and more moving parts in the swing than he needs to have. The shafts were too weak in flex meaning there is a miss right, as the shaft lags open at impact. The swing weight of the clubs was too heavy especially in the head, creating a steep swing plane. Bring the swingweight of clubs down to make it easier from him to swing the club, through better balance of the new weight. Increase the stiffness of the graphite shafts to produce more consistent lower spin and accuracy control through the shafts deliverance!